When it comes to the Toyota brand, customers have come to revere its commitment to quality, innovation and durability, which, in 1996, became the foundation of the Toyota Certified Used Vehicles program. Year after year, this program has gained momentum, totaling more than three million sales and counting. Toyota's certification process keeps our drivers in mind by offering a high-quality, low-mileage Toyota that makes a perfect choice for smart shoppers who want to get behind the wheel of their favorite Toyota model while saving a few thousand dollars in the process! The program's standards apply from the time a Toyota dealer acquires the vehicle through to the final sale. Each candidate for certification can be a current model year vehicle, up to and including six-year-old models, with 85,000 miles or less on the odometer. Prior to the rigorous 160-point inspection every certified Toyota goes through, a CARFAX® vehicle history report is reviewed to ensure that only the best of the best vehicles receive the Toyota Certified seal of approval. Now how's that for peace of mind? 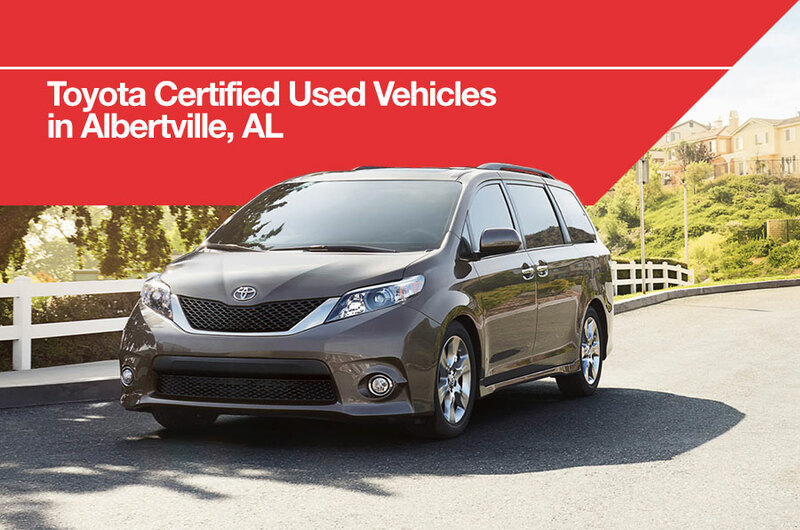 If you'd like to become the proud owner of a Certified Used Toyota or for a test-drive, simply stop by Sand Mountain Toyota located at 9167 US Highway 431, Albertville, AL 35950. One of our knowledgeable and friendly staff members will be glad to assist you. We look forward to serving our customers from Albertville, AL, and throughout Huntsville and Guntersville!